Many jobs can be hard on your feet – and if your feet aren't comfortable, you aren't comfortable. In order to be at your best while working, it’s necessary to have the proper footwear. 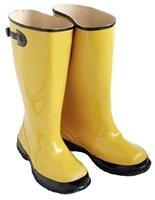 From steel-toe work boots and waders to the simplicity of comfortable shoes, Professional Safety Supply carries a large selection of industrial, commercial and public safety footwear and accessories to address your needs. Great prices on top brands like Ariat, Justin and Twisted X.